Or is The Telegraph talking out of its arse? Not too much doubt about what this article means is there? This all seems fairly unequivocal, but if you read further down the article it goes on to say that “he won’t be doing the full climb as it will take a long time”, which seems to suggest that he won’t be climbing ‘Mount’ Everest at all, and will only be trekking into base camp to say hello. Or he may not even be doing that. So what’s going on – is he or isn’t he, and why the misleading headline if he’s not? And how about the security situation – when Harry went to Afghanistan didn’t they only tell us about it after he came back, not announce it to any would-be terrorists 3 months in advance over the internet? Let’s analyse it in more detail. As far as I can see there are 4 possible scenarios. While climbing Everest takes a great deal of stamina, determination, and the ability to acclimatise to extreme altitude, lots of very inexperienced people do manage to get up every year. 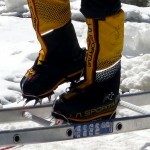 The mountain is not especially technical, but it does require some training in technical skills, such as use of ice axe, crampons and rope work. While most people who attempt it with little prior experience find themselves ill-prepared and don’t get anywhere near the summit, a small minority are successful. The Walking with the Wounded team were not mountaineers, but a number of them successfully summited 8163m Manaslu, the 8th highest mountain in the world last October (I should know – for I was there too, and saw them coming down from the summit as I was going up). But how about the security situation? Harry will have to be on the mountain, on a known route within a very small known area, for almost all of April and May, in order give himself enough time to acclimatise. A word or two for any security officers, then: be careful of those aluminium ladders strung together with ropes over the crevasses in the Khumbu Icefall where the binding can be easily broken. Not to mention the hundreds of metres of intricate crevasses Harry will have to walk through where it’s probably quite easy to conceal explosives … and then the fixed ropes on the summit ridge, where any number of anchors could come loose … and then there’s the puja ceremony before the climb, where Harry will be forced to drink large quantities of home made Nepali whisky which has been known to cause alcohol poisoning in the past. There will even be Frenchmen at base camp, who have a reputation for bumping off royals, though these can be easily spotted after a cursory scan of the mess tent, where their cook will be slicing fresh vegetables with a guillotine. 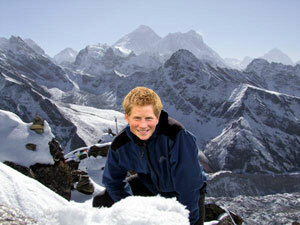 Prince Harry at Gokyo Ri, with Everest behind. Either that or its a badly Photoshopped picture of some other idiot. This is a bit more likely. Most itineraries for the Everest Base Camp trek allow about 10 days to walk from the scary airstrip at Lukla, which is sufficient time to acclimatise. He will be following a known route lined with any number of tea houses for would-be terrorists to hide in, but he will have a choice of 10 day windows within the 2 month period that the Walking with the Wounded team are likely to be spending on the mountain. He could even take the quieter alternative route over the Renjo La and Cho La passes and across the lovely Gokyo valley, and slip out again by helicopter. This route also gives him the opportunity to stop off at the clifftop Buddhist monastery in Thame, where the monks will be only too happy to instruct him in how to alleviate suffering by learning to shake off worldly cravings, like the one he has for Pippa. This is unlikely. In the 1960s, a Japanese company built the Everest View Hotel at 3880m high in the Khumbu so that rich and elderly Japanese tourists could fly in by plane, spend a couple of nights in a posh hotel with views of Everest, then fly out again without having to exert themselves in any way. There was a problem, however. Flying elderly people to 3880m without giving them an opportunity to acclimatise isn’t a very good idea. Many of them got severe altitude sickness and had to be flown straight out again before they died. 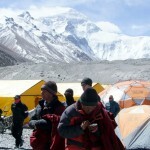 Of course, Harry’s fit and healthy, and not in any way elderly, but at around 5400m Everest Base Camp is a good deal higher than the Everest View Hotel. Unless he gets himself pre-acclimatised such as by climbing ‘Mount’ Eiger or ‘Mount’ Mont Blanc in the Alps, then altitude sickness may well end of doing the would-be terrorists job for them. I could be wrong, but this is my preferred option. It seems more likely than any of the above. 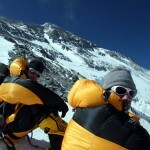 The mountain’s not even called ‘Mount’ Everest, it’s just Everest, or Chongolungma to give it its original Tibetan name. So what other other headlines can we expect from The Telegraph this year? Prince Harry really will be competing against ‘Run’ Usain Bolt this summer (to follow The Telegraph’s convention of putting a superfluous verb in front of an object). Harry will be running into the Olympic Stadium and shaking hands with Team GB before getting a chopper out again. Harry has been lucky enough to obtain a ticket, and will be watching the 100m final from the royal box. He isn’t even going, and The Telegraph just decided to invent the headline for the sheer hell of it. So where does all this get us? Why did the The Telegraph publish its article, and why have I even bothered to write this post (it’s a question I often ask myself)? Well, I notice The Telegraph has been kind enough to include a quote from yet another young lady who is aiming to be the youngest person to do something silly on Everest (such as climbing it). If she’s lucky, some sponsors may read the article and help pay for her holiday. The Telegraph may also like to know that I too will be trying to climb Everest this year (from the north Tibetan side, rather than from the southern Nepalese side) if they ever need a few cheap quotes to help pad out their articles. Harry might even want to pop over for a coffee seeing as I’ve helped chip in for his helicopter fare. I’m also reasonably confident that should I make it to the summit I will probably be the baldest person from Kingston-upon-Hull ever to have done so. 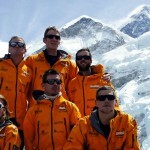 We’re also aiming to be the team who drink the most red wine on Everest this year. I’ve always paid for my own mountaineering holidays – it seems only fair given that I actually quite enjoy climbing mountains – but if anyone fancies chipping in then I might even do something silly, like wear a sporran all the way up, or get a photo of me playing a tin whistle in down mitts if I make it to the summit. With great marketing ideas like this I don’t even have to write anything ridiculous about Prince Harry in order to help raise awareness about my climb. Oh, bugger … I think I just have. Hi Mark, Happy New Year to you! That said, most of us Brits who are old enough to remember now look back at those glory days with fond affection. Unlike the Swiss, Italians and the French, we are not a nation of mountaineers – more hill-walkers and rock climbers – but in spite of that handicap we conquered the world’s highest mountain before anyone else. I’m not saying that Mount Everest is ‘our’ mountain, but it’s name reflects the history of the mountain more aptly than any other. And for the record, I’ve never heard a Nepali or Tibetan refer to it by Sagarmatha or Chomolungma either. Whether or not, for the sake of brevity, we should now drop the prefix and simply refer to it as Everest, I think is a matter of personal choice. I for one believe that Mount Everest captures a sense of romance from that golden era, which has long since been lost by climbers who value getting to the summit as of far more importance than the journey itself. Absolutely! Up there with the invention of the wheel and the discovery of penicillin, I guess? Lol! On a more serious note, I imagine that security could’ve been the real issue. 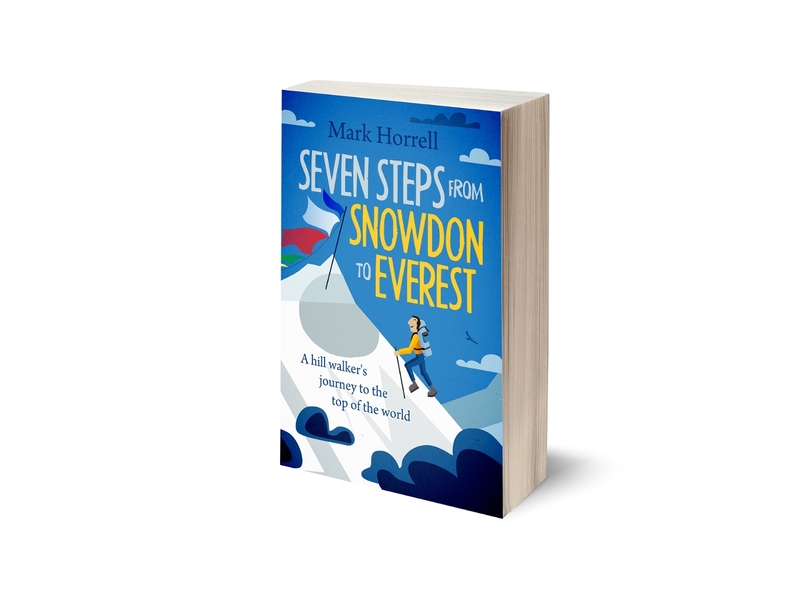 A walk to the North Pole is one thing, where there’s no one else around and it’s at sea-level, but an attempt on Everest is a completely different matter. Imagine if he got into difficulty high up, or even worse, someone tried to nobble him. The public debate would go on for years! Pole and Everest are two different things. It is difficult to climb because you need more stamina than walking. Their is less oxygen on high altitude and more danger. Thanks for posting. Your comment is valid, so I’ve allowed it to remain. There are a couple of things about it that are borderline spam, so please can you follow these guidelines if you decide to post here again. These are good practice to follow on all blogs that you post to, and will make their owners appreciate you more. 1. Please can you fill in the Name field with your name rather than keywords. 2. You are welcome to include a link back to your website in the Website field, but please link to your home page rather than individual trips your company offers which match the keywords that you’ve entered. This is definitely spam. Many travel bloggers post here and include a link back to their site. I don’t mind this at all, because they have a genuine interest in the post and are contributing to the discussion. 3. This site automatically applies ‘nofollow’ attributes to all links in comments. Most blogs do this. These attributes cause search engines to ignore the links, so keyword stuffing the Name field won’t help your ranking in Google anyway. 4. I’ve removed the link for this comment, and also for the other comment you posted, where you called yourself ‘Annapurna Circuit’. I’m happy to leave the links in place in future if you follow the above guidelines. However, please only post here if you have a genuine interest in the content. Many thanks, and good luck with your trips!